Cinnamon and Apple – The wintry cinnamon spice goes perfectly with chopped apple. Why not try warming your apple in the microwave first for a few seconds or adding some walnuts or raisins to the mix. Date and Hazelnut – Simple as it sounds. Throw a few pitted and chopped dates and hazelnuts onto your porridge for a great healthy topping. Make it even more luxurious by stirring in some cocoa powder for a chocolatey breakfast too. Strawberry, Banana and Greek Yoghurt – This deliciously simple topping is great for the kids too! If you want something a bit fancier, sprinkle some chopped coconut on too. A drizzle of honey is also perfect on this one. Blueberry and Peach – This one doesn’t have to be pricey. Stick to tinned peaches and frozen blueberries when the fruit is out of season. Not got time in the morning? 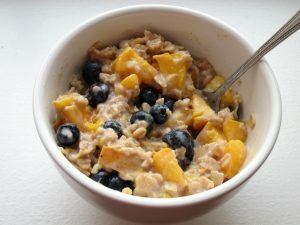 Why not try overnight oats. Pop your oats (50g) and milk (120ml) into a bowl or container in the fridge overnight. The oats soak up the milk to give a delicious mix for the morning. You can add Greek or natural yoghurt in too to make it even creamier. Try adding some cocoa powder for chocolate porridge, frozen berries or cinnamon and raisins. A top tip is to save some topping for the morning such as nuts and fresh fruit to add some crunch to porridge.